It's time to determine the types of flooring: Pre-finished, Unfinished, Engineered, Solid,or Laminate. Find out which best suits your application and needs. 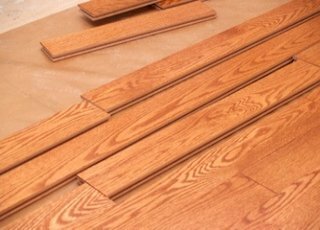 Here are some things you should know about these types of flooring Pre-finished and Unfinished hardwood flooring before making your purchase. 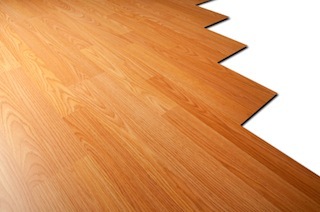 Pre-finished wood floors are manufactured finish. You don't have to deal with the mess from sanding and finishing your wood floors. Install them, then just move in, how easy is that! Choose one that contains Aluminum oxide, in the finish. It's the most scratch resistant finish available. Most flooring companies offer them. And, they also have a great warranty, 15, 25, up to 50 years, on them. Be aware that some pre-finished wood floors can be very slippery, which can cause injury to you, your friends or family. You can choose one with more surface texture or with a different type of wood floor finish on them, for a less slippery surface. These types of flooring come with a micro-beveled edge. Some are larger than others. The function of these beveled edges are, so that you don't feel any unevenness between boards, under your feet, after they've been installed. Where as, with square edges you would notice. They also outline each board, and over time will collect dirt and grime. Unfinished wood floors must be site finished. After you've installed them, you must then sand and apply several protective coats. By sanding it, you will have a flat, smooth, seamless surface. Also, you don't have to be careful, when you're installing them. Apply several protective coats, to prevent damage from liquids, dirt, and everyday foot traffic. 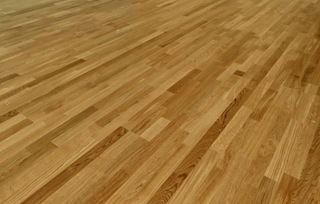 The most common wood floor finishes are polyurethane (oil base or water base). For more details, see refinishing wood floors and wood floor finishes. 1.You can achieve a more seamless look. Your floor boards will be more even to each other after it has been sanded, so it feels better under your feet. 2. You can apply any type of finish you like, to achieve a certain look, to match your interior design. I recommend investing in a high quality polyurethane wood floor finish, when possible. Protect your investment, the best you can, to make them last longer. Have an idea of which one you would like to have? Let's learn about other types of flooring, first. You'll then have a better idea, of which hardwood flooring you would like to put in your home. Solid hardwood floors, Engineered hardwood floors,or Laminate wood floors?